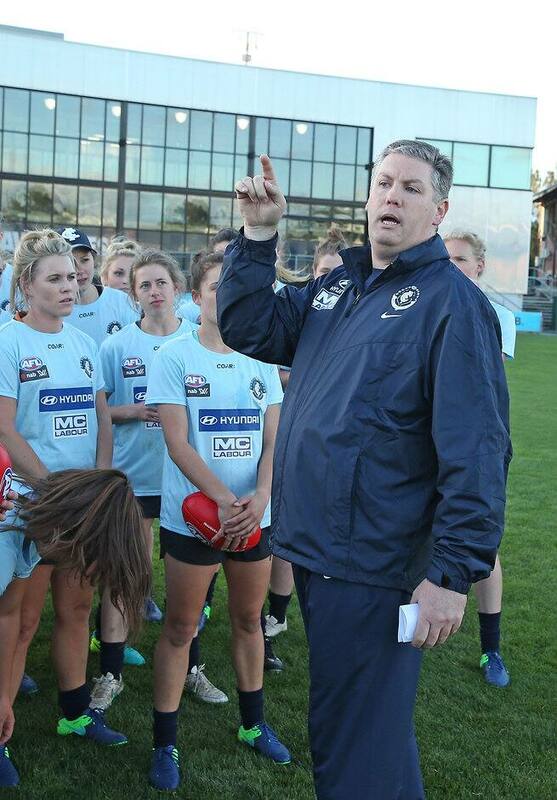 CARLTON coach Damien Keeping believes his team will be well prepared for the summer-based NAB AFL Women’s competition. With the competition getting underway in early February and with 16 players per side, Keeping said one of the parameters for the Blues’ drafting strategy was finding athletes who could perform in sizzling conditions. "There’s a capability element we identified before the draft and a fitness component was part of what we looked at," Keeping said. "We’re identifying how we’re going to look after the players." Keeping coached the Western Bulldogs in the AFL women’s exhibition series matches against Melbourne and developed his passion for women’s football while at the Calder Cannons in the TAC Cup under-18s competition. "By chance, the (Victorian youth girls’ academy) would begin training when the under-18s finished and I would stay on the track and get involved," Keeping said. "The group of girls I had back at the Cannons had an enthusiasm for the game that was wonderful and I found that continued right throughout the women’s sides I got to coach." Keeping was named coach of the women’s team last June and has worked closely with the Blues’ AFL coach Brendon Bolton since. "We’ve done a fair bit of work together and he’s certainly been there as a sounding board for any challenges we’ve had," Keeping said. With lists of only 27 (some clubs have one or two more because of long-term injuries), a healthy list could prove a major factor in the competition. "There’s a process the AFL has put in place where we have a feeder group at AFL Victoria we can go to if we need to draw on replacement players for injuries," Keeping said. "We’ll nominate to the AFL that we have an injured player and then there’ll be a group, picked in conjunction with AFL Victoria, that we’ll be able to select from to help fill that spot." Carlton’s first draftee, forward Bianca Jakobsson, credited Keeping for her development throughout 2016. "He coached me during my exhibition matches at the Western Bulldogs and part of the reason I’ve grown so much is because of his expertise," Jakobsson said. Keeping said he’s enjoyed the challenge of transitioning from coaching in exhibition games (with the list changing every game) to having one group of players at his disposal. Meanwhile, Lauren Arnell will be the club’s first women’s captain, the Blues announced on Monday night. Brianna Davey and Madeline Keryk were named vice-captains. "With the rich history of Carlton and the talent of many of my teammates, it’s a massive honour to be named captain. It is humbling," Arnell said.